To get dependency injection working, I like to create a Startup.cs that, somewhat, mirrors a .NET Core Web application. Essentially we create a configuration builder and a ServiceCollection. The ServiceCollection and IServiceProvider. The ServiceCollection is, really, our DI container. The Main method it will look very similar to a web app. It will also execute our Application by getting an instance of it and calling the “Run” method. Note the call to a method called “ConfigureServices.” This is where are of the dependencies are configured. Also note the single line that calls “AddUserSecrets.” That will be discussed a bit more later. // Some libraries may still rely on web context type stuff.. Note the last service that is added is our “Application.” This is synonymous with the default Program.cs that is created when you start a new console application. Creating a Startup class similar to this allows our Application class to have whatever dependencies injected. Sure, this may seem like a long way to go, but if you have a ton of dependencies, you’re migrating a web app to a console app, or have another similar scenario, using DI, getting the environmental niceties of a typical Web app, and other features within your console application can be very convenient. One of those nice features is user secrets. As I pointed out above, you can import your secrets using the command “AddUserSecrets” builder extension method. Typically, user secrets are only available for web applcation. It’s pretty easy to get them working in the console application. The only limitation that I have found is that Visual Studio won’t give you the nice context menu for editing secrets. 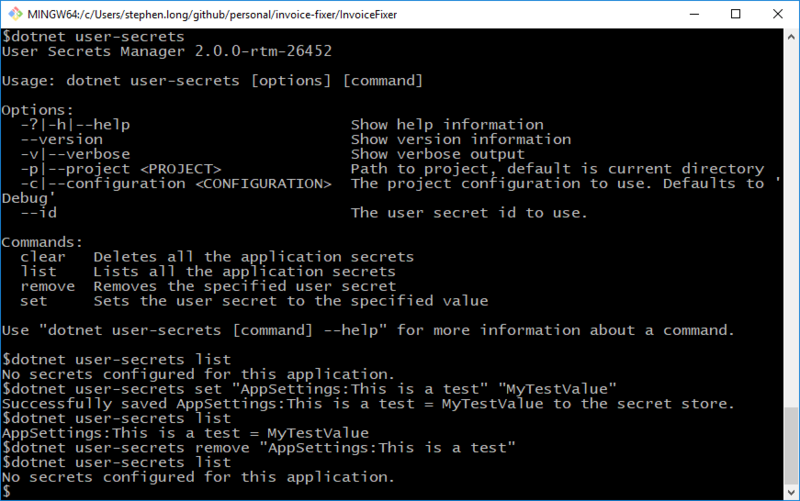 But, using the command line “dotnet user-secrets” works well enough. You can also browse to your AppData folder and modify this JSON file directly. After that, we can open a command prompt within the directory that contains the console application project and manage the user secrets there. That’s really it. With all this set-up in place, we get DI, user secrets, and general environment handling with our console application.